Your essential Canon EOS-1D X Mark II camera field guide in a convenient pocketable style. This EOS Pocketbook is a concise guide to your camera and small enough to carry with you everywhere. Nina Bailey, Technical Editor of EOS magazine and author of the popular EOS eBook series, has the solution. This Pocketbook for the Canon EOS-1D X Mark II is a concise guide to the most used and confused features and controls on your camera, based on Nina’s vast experience as lecturer at EOS Training Academy – hearing first-hand what photographers want to know and understand about how their EOS-1D X Mark II camera operates. Still to use but looks good. A quality product thank you Nina Bailey. Excellent source of information from a pocket sized booklet. Super little book to take anywhere knowing those last minute doubts are covered in it somewhere ! 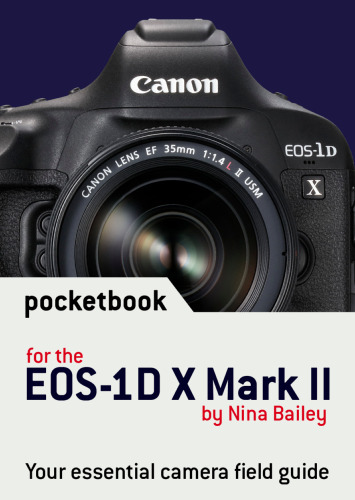 This pocketbook is well written, concise, and should be helpful to all users of the EOS-1D X Mark ll who have not mastered the hundreds of pages of the manual that came with the camera. Very helpful! A very useful set of user instructions laid out in an easy to locate format. Excellent for checking things I have forgotten when in the field. Perfect for my needs and will help when I’m in the wilds of Tanzania later this year. Yes it’s small, as other reviewers have commented, but if you read the description you’d know that it is. It seems good enough, though I've not had time yet to go through it properly. I suppose it is what it says it is 'A Pocketbook" but it does seem rather thin considering the price paid. I somehow expected a lot more for the price paid.